Burger King is the worst. Seriously. The absolute worst. I remember at a certain point, several years back, thinking that it was one of the better fast food joints. But then the quality started going downhill, and at first I thought “oh, I must be at a badly run Burger King,” but no. They’re all bad now. I’m not a fast food snob. I enjoy it, for the most part. You have to adjust your expectations, obviously, but a Big Mac can be quite satisfying when the craving hits. So when I found out that Burger King was serving a McRib-esque sandwich, my better judgment told me to stay away, but hey, you only live once, right? I should note that I actually do like the McRib. Maybe it’s because I have fond childhood memories of the thing, but every time McDonald’s brings it back I feel obligated to eat it at least once. Burger King’s version has all of the same components (barbeque sauce, mystery-meat-pork patty, and pickles), save for the onion. But it is — surprise, surprise — not good. 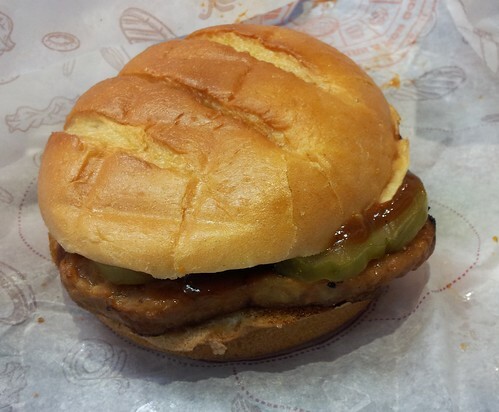 The salty patty is a lot chewier and more rubbery than the McRib, and the cloyingly sweet barbeque sauce is one-note and vaguely unappealing. The bun and pickles are fine, but the whole thing was kind of gross and nothing I’d ever want to eat again. I tried the new doughnut holes, too, which were also pretty gross. Can we just use the words Burger King as a replacement verb for gross? I think so. The doughnut holes were pretty Burger Kingy. Doughy, soggy, and downright mushy, the only highlight was when I remembered that I am a human being with free will, and can choose to never eat another one of these for as long as I live. I wish I could make that choice for Burger King in general, but I know curiosity will drive me back here when they introduce something else new to their menu. Oh well.